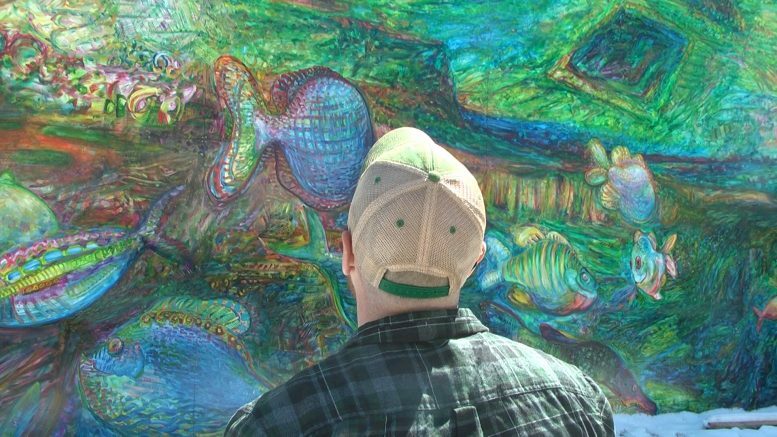 (Photo Courtesy/Mike Beiermeister) Business owner Griffin James looks at the almost-finished fish mural on Monday afternoon. Alpena, Mich. — A community landmark is on the verge of being completely restored. With the help of Art in the Loft and artist Tony Hendrick, the community will soon be able to fully enjoy a new fish mural. October 24, 2017 was the day that the fish mural crumbled due to mother nature. Two years later, community members have helped piece back together this iconic art work, and now, it’s on the verge of completion. “We’re at that point where we can say that we are one month away, or roughly one month out from this being rebuilt,” said Art in the Loft executive director Justin Christensen-Cooper. Business owner Griffin James has the unique privilege of having his business attached to this hallmark, literally. “I look at it every single day, and it just fills me with happiness,” said James. Initially, there was a fear that the mural wouldn’t come back, but the community rallied in response to help breath life into something that was crumbling. The rebuilding process has had all hands on deck, with community members young and old putting their touch on 3–d elements. It speaks volumes to the people that call Alpena home. “No matter if we face somewhat of a disaster, we always land on our feet, we always come back from it,” said James. The mural is expected to be completed this May. If you would like to leave your mark on the mural, stop by Art in the Loft this Friday from 6:00 p.m. to 8:00 p.m.
there will be free painting, wine tasting, a cash bar, and music for the community to enjoy.